PCWin Note: Outlook Express to Mac Mail Conversion 2.0 download version indexed from servers all over the world. There are inherent dangers in the use of any software available for download on the Internet. PCWin free download center makes no representations as to the content of Outlook Express to Mac Mail Conversion version/build 2.0 is accurate, complete, virus free or do not infringe the rights of any third party. PCWin has not developed this software Outlook Express to Mac Mail Conversion and in no way responsible for the use of the software and any damage done to your systems. You are solely responsible for adequate protection and backup of the data and equipment used in connection with using software Outlook Express to Mac Mail Conversion. IncrediMail to Mac Mail Conversion - Try IncrediMail to Mac Mail Conversion tool that exactly converts IncrediMail files into Mac Mail with smart features. It converts multiple IMM files from IncrediMail to Apple Mail by using its batch mode. Import Multiple Contacts from vCard - Import multiple contacts from vCard to Outlook contacts using our software to get the best features and easiness to import multiple contacts into Outlook files. You can also import multiple contacts from Outlook to vCard as well. Sync2 for Outlook - Microsoft Outlook synchronization add-in. Sync Outlook between computers without a server, using shared folder on LAN, USB drive, FTP. Share Outlook Calendars with Google Calendar. Sync Google Contacts, Tasks with Outlook Contacts and Tasks. 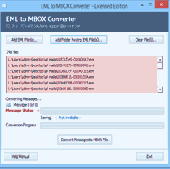 Import EML to Mac Mail - To successfully Import EML into Mac Mail, you can try EML in MBOX Converter Software. The software perfectly imports EML emails to Mac Mail. It is easy to use with simple techniques to import EML files to Mac Mail MBOX in instantly. HP Driver Updates Scanner - Download and update your HP (Hewlett Packard) laptop drivers automatically supporting HP laptop models like Pavilion, EliteBook, ProBook, TouchSmart series etc.). And update or install HP printer drivers, HP laserjet drivers, HP scanner drivers etc. Convert IncrediMail to Mac Mail - The IncrediMail to Mac Mail Converter is enjoyable program that would be able to convert IncrediMail to Mac Mail. Using this conversion tool, you will get exact result for converting IMM files into Mac Mail with attachments.